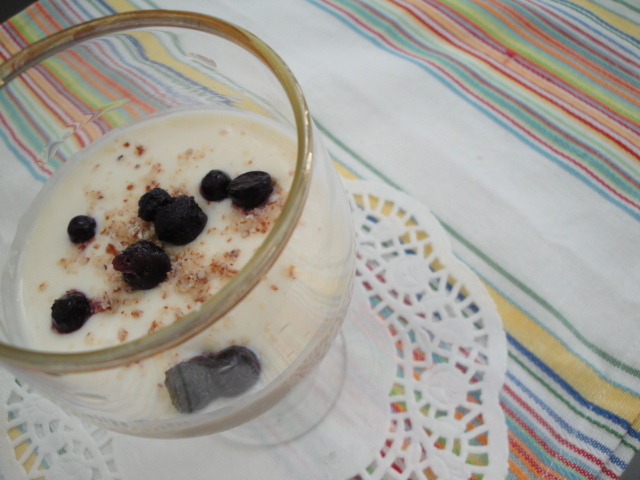 This pudding is so satiating, sweet, and healthy that I know I will be making it again sometime soon. It is great as a snack, dessert, or post-workout fuel! And what is the best part? It's ÜBER easy to make! Yes, I did say ÜBER. :P I happen to love that word; it's very sophisticated. So is this simple snack. It looks so light and fluffy in a sophisticated glass. Simply add all the ingredients in a blender or mixer and ta-da! You now have a protein pudding. *Note: you can taste the tofu in this recipe in case you're not fond of it. This recipe makes 2 small servings. I was originally wanting to use vanilla beans in the pudding, but I guess I used it all up! Let me know how it tastes if you make it that way! Garnish with your favorite toppings and relax after a hard work out routine!